BOP ON TREND: Ride em' Cowgirl. Be comfy and stay warm in western-inspired knits. Sure college sweatshirts are great (I have a TON of them) but you can stay warm and attain weekend-chic simply by pairing a more fashionable sweatshirt with leggings (oh, the power of leggings!). How easy is that? You don't need to go crazy with a stylish outfit, let that comfy sweatshirt do it for you! 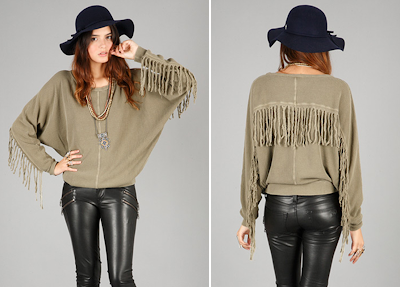 I love the fringes on this Sam & Lavi piece and covet the dangles on the back just as much as the sleeves. Kim K. was recently spotted wearing the sweatshirt in gray. This Elizabeth and James pullover is pricey but that won't stop me from lusting for it!